Yahoo this spring made a $1 billion bet in acquiring Tumblr that the social blogging service would help it expand its audience and generate more ad revenue. While still a nascent ad platform, nearly a third (31%) of top brands have already set up a marketing presence on Tumblr, according to new data from Simply Measured. For its study, the analytics firm looked at the Interbrand 100 Brands on Tumblr between July 5 and August 4. Adoption of the service lags other social media properties, including dominant players like Facebook and Twitter, where nearly all major brands have a page, as well as Google+ (76%), Pinterest (74%) and Instagram (68%). Of the 31 brands on Tumblr, 27 are also on Pinterest and Instagram, indicating that they are at least experimenting with each of these networks to share visual content. Nearly seven in 10 brand posts feature original content with the balance being reblogs of other Tumbler posts. And almost all posts (95%) are photos, generating 98% of reblogs. The study also found that 13% of brands post more than three times a week, with 10 doing so more than 10 times a week. MTV, Ralph Lauren, American Express and Tiffany & Co. were among the most active. The company introduced advertising last year in its Radar section and more recently rolled out an in-stream ad unit that runs in users’ “dashboard,” or news feed, in the desktop and mobile. Yahoo CEO Marissa Mayer has also indicated that the Web giant will ramp up native advertising on Tumblr in the coming year. For now, brands are reaching out to consumers as they do on other social sites through organic posts to their Tumblr accounts. One of the interesting findings is that posts tend to have a longer shelf life on Tumblr than Facebook and Twitter through “reblogs,” or reposts of updates. Almost a third of reblogs (29%) took place more than 30 days after the initial post. “This longevity is something we haven’t seen on other social networks, and is one of the most attractive features of Tumblr’s platform,” the report stated. As an example, it pointed to MTV, which received 62,000 reblogs, with almost half posted prior to the study’s 30-day period. 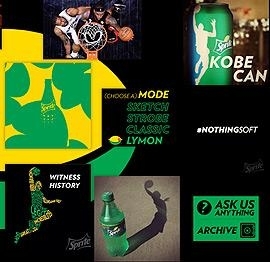 Sprite, however, claimed the most reblogs in the period, with more than 85,000 for a single post with an animated GIF of a game of spin the bottle. While that post was removed from the study averages as an outlier, it reflected the animation-heavy, interactive nature of the beverage brand’s popular Tumblr page. Direct reblogs overall accounted for about 40% of all reblogging activity, meaning that most content-sharing happens downstream. 1 comment about "A Third Of Top Brands Have A Marketing Presence On Tumblr". Remy Tennant from Piqora, August 22, 2013 at 5:35 p.m.